In general, Kyle Yount does not like to speak about himself in third person. So that’s why I’m switching to ye olde standby for this bout. Hi, folks! My name is Kyle and I love Godzilla. Not just the king, either… I take pride in being able to enjoy all of Japan’s giant monster films. Am I an expert? Not by a long shot, but that’s kind of the point with this podcast – I want an excuse to learn more about Godzilla, his friends, his foes and the men and women who have created this fantastic genre! I used to run Henshin! Online with August Ragone, Bob Johnson, Keith Aiken, Aaron Cooper and may others (I was just the webmaster). I also have a little website called The Shrine of Gamera. 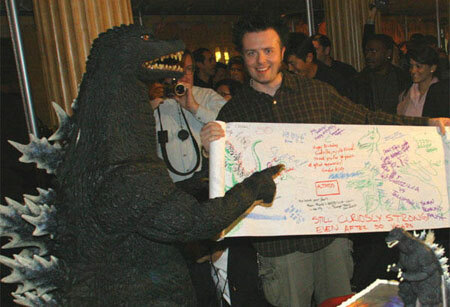 In 2004, I put on the 50 Years Of Godzilla Film Festival here in Portland, Oregon at the Hollywoood Theatre. I’ve had a really great time learning about and sharing my love for Godzilla. Since there’s been a lull in Goji films since 2004, I’ve found myself focusing on other fandoms, but I needed a good excuse to get back into the game. I have some friends who run a horror movie internet-radio show every Friday on the Portland Radio Authority (praradio.org – and hopefully I can get them on my podcast a few times) and they’ve asked me to come in a few times and be on their show – let me tell you, it was a blast! Every time I’m on the show it’s just really fun, I have a great time talking about Godzilla. So after my last appearance, I decided to take the step into podcasting. Because I’ll be playing Godzilla music on the show, I am opening another door to Godzilla fanaticism that I have yet to really dive into, soundtrack collection. My goal will be to involve myself not only with collecting, but learning to appreciate the subtle changes between composers and themes in the soundtracks. So I hope you enjoy the show – I know I am!